As my bathroom is nearing completion (finally!) I am starting to look around for a few highlight pieces. Just that little something special to make the room unique. I mentioned in a previous post that I was tempted with these Italian silvered candlesticks which look fabulous wherever they have been placed around the store. Well, they have had their chance to find another home, but it looks like they will just have to come home with me! I love the detail. They date to around c.1800 and have a lovely red colour underneath the silver. 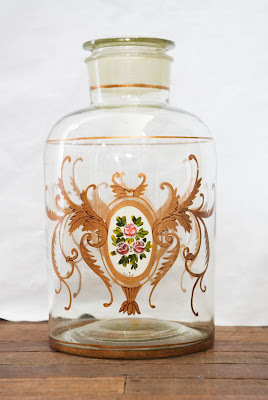 We once had this lovely 19th century decorated apothecary jar in store, many years ago. I was sorry to see it sell but the lady who bought it put it into her bathroom and it looked fabulous. It was her little something to make her bathroom unique. Whilst quite a bit plainer, I have always admired these three jars that we have had in store for a while. They too are apothecary jars, French I believe. I really like the chunky ground lids. I plan to put the jars in my bathroom cabinet (the one with the glazed doors I showed in a previous post). I don't mind if I leave them empty, but the sea urchins look interesting, do they not? I may have to find some other jars to display the urchins in store. I know your bathroom is going to be outstanding Tammy, you such a talent for using the perfect accesories to add those fabulous finishing touches to a room. I agree with Ria and Millie above, wholeheartedly!! I too have admired those french apothocary glass jars and the mirror also....I hope it works out that the mirror goes home with you eventually, as there's just that something special about it, and I'm glad those candlesticks decided they wanted to come home with you also. Hi Ria, Millie and Janine, I am happy that everyone likes my choices for the bathroom. But please do not encourage me any further with that mirror!!! I am already half way there. 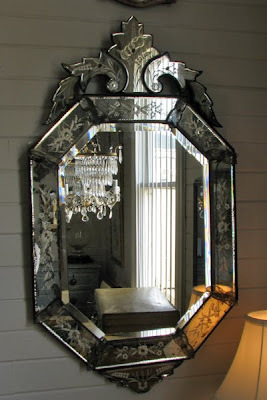 I will have to put a photo of the mirror I have on the blog and get opinions, I think...Have a great week, and Happy Valentine's Day! I absolutely adore those candlesticks and wish I could have them for my own home, oh well I'm sure they will look stunning in your bathroom. Just let me know when you get similar ones. I too have a fondness for glass jars and don't mind displaying them empty. I hope you are going to show your bathroom when it is finished would love to see it.